When it comes to high-density storage solutions, Drive-In and Drive-Thru Pallet Racking Systems offer efficient and effective options. These storage systems comprise of uprights and support rails. The rails in this static system run through the depth of the racks. Pallets can be placed conveniently on the support rails with the help of a forklift. 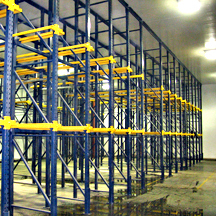 Both systems are typically designed to store from 2 to 10 pallets deep per pallet position. 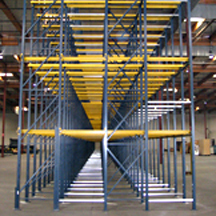 Drive-In pallet racking systems have a single entry/exit point. The pallets are loaded and retrieved from the same side making the last pallet loaded the first to be retrieved. 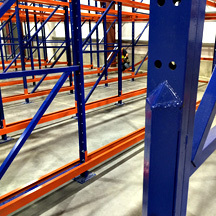 The forklifts load a product on to the support rails by entering and retrieve while backing out of the rack. This type of pallet rack is called a Last In, First Out inventory system, otherwise known as LIFO. This racking system is perfect for products that are not date sensitive. 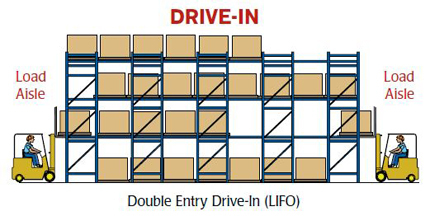 The defining feature that separates a Drive-In pallet rack system from a Drive-Thru one. is the single opening for the forklift for loading as well as unloading. Both Drive-In and Drive-Thru pallet racks offer excellent storage space, however, Drive-In racks are often closed at one end by a wall or other installation. 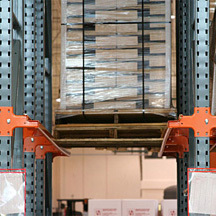 The forklift operators must drive into the racking system from one side and remove the pallets from the same entry point. Drive-thru pallet racking systems have a separate entry/exit point. 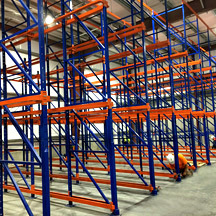 The rack operators can enter the pallet racks to load the pallets from one end and unload the product from the other end. Additionally, both points can be used for loading and retrieval. Drive-Thru pallet rack systems differs from Drive-In systems as they use a First-In-First-Out inventory retrieval system, also known as FIFO. The first pallet loaded on the rail system is conveniently the first pallet to be removed from the other end. This rotation of product through FIFO method makes Drive-Thru pallet rack perfect for date-sensitive pallets. Fast moving items or perishables can efficiently be stored in Drive-Thru rack. from the same entry point. Both Drive-in and Drive-thru pallet rack is usually available in both structural and roll formed steel and are easy to set up and install. The simple support arms strongly hold the support-rails in place. 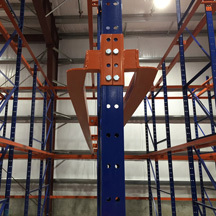 The adaptability of the structure allows it to be attached to standard pallet rack, as well as special structural designs. The racks can be tied to the overhead structure, or more efficient overhead bracing can be used to give the racks firmness and rigidity. These systems depend heavily on forklifts for the movement of products. This fact increases the potential for pallet rack damage. It is imperative for the forklift drivers to meticulously follow pallet rack safety rules and report any damage to the rack systems. Both Drive-In and Drive-Thru pallet racking systems offer comprehensive and cost-effective storage options for large quantities of similar products. They offer incomparable storage capacity at very affordable costs.